Sybil Joyce Ramey, 85, passed away at a local nursing home facility on Friday, April 24, 2015. Funeral services will be held on Tuesday, April 28, 2015 at 2:00 p.m. in the Elliott-Hamil Funeral Home Chapel of Memories, 542 Hickory St. Burial will follow in the Potosi Cemetery. 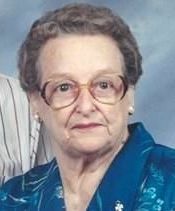 The visitation will be at the funeral home on Monday, April 27, 2015 from 6:00 p.m.-8:00 p.m.
Sybil was born on March 31, 1930 in Abilene to Charles Watson and Willie Belle Gordon Clements. She married Ernie B. Ramey on Septemenber 3, 1948. They were married for 65 years. She was an active member of Grace United Methodist Church for many years where she taught sunday school, volunteered in the nursery, and was involved in many U.M.C. Women's ministries. She was a loving homemaker and was ever present for her children and husband. Whether it was attending plays, being active in the PTA, or being involved with many other activities her family was involved with, she was a devoted, loving, and constant support for anything they did. She is predeceased by her parents, her husband, and brothers, Robert and Clifford Clements. Those left to cherish her memories are her son, Kenneth Don Ramey, of Abilene; a daughter, Carole Alcorn and husband Dale, of Merkel; grandchildren, great-grandchildren, and numerous nieces and nephews. The family would like to give a special thanks to the staff of Coronado Nursing Center for all the friendship and loving care. A special thank you also goes to the staff of Hendrick Hospice for their care and support. Memorials may be made to Meals on Wheels or the Grace United Methodist Memorial Fund.